September is Disaster Preparedness Month, and a useful tool for disaster situations is a carbine for protection of home and business. Here are five suggestions to equip and handle yours for maximum benefit. The market has vastly improved both choices and functions of slings in recent years. A two-point sling is practical in that it allows you to wear a long gun across your back or chest, and unlike a one-point model, won’t act as a knee- and furniture-whacking pendulum when you need to use your hands off the gun. Setting up your sling is a process that entails choosing appropriate hardware, adjusting it to its shorter length that allows you to carry the carbine close to your chest, and ideally, mastering the quick-adjust function that instantly lengthens the sling to allow you to deploy the rifle from positions that require more length. My current choice is Blackhawk’s multi-point sling. Its thumb-operated adjustment loop is easy to use and keeps sling adjustment under the gross motor action umbrella, a good asset under stress. Once the sling is set for you, trimming or taping any excess webbing is a good way to keep loose ends from distracting you or catching on objects and interfering with weapon manipulation. Pick a weapon-mounted light with a lumen rating that’s appropriate for your anticipated environment. 1,000 lumens or more is appropriate if you’re responsible for securing a wide-open outdoor area. 300 should be sufficient for a small home or office; any brighter can produce blinding splash-back. Especially with weaker illumination, mount the light so the portion of the barrel/handguard in front of it creates minimal shadow. As with sling operation, train with your light so you’re able to turn it on and off without a fuss, including while shooting. Nighttime shooting accuracy is usually surprisingly good, so it’s alright to keep the round count low and focus on operating the light. Don’t fall into the trap of staying in a static, standing position in practice. Move as much as you are safely able to, with a plan. Turn on the light, shoot, and then move laterally away from the recently lit area. Step aside, off the “X” or line of force of the imagined assailant, AKA your target, as you shoulder the carbine, firing from the new position. Practice hitting accurately while moving from standing to kneeling, kneeling to prone, and back again. 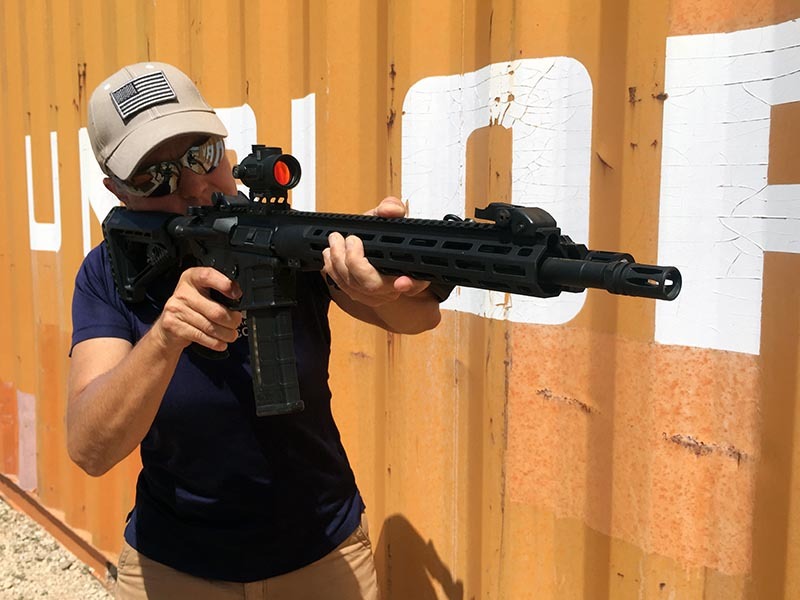 See what it takes to be accurate at close range from behind a barricade that represents a door jamb or furniture—keeping in mind that there’s a mechanical offset between your muzzle and field of view! The unexpected spray of splinters or glass can be unsettling if you fail to take this into consideration. Movement may be uncomfortable at first. With practice it becomes fun, and may save your life by making you a tough target to hit. In pistol training, the muzzle-down, next-to-chest “sul” position is commonly taught for close quarters use. The same applies to carbine handling, with adjustments for differences in weaponry. 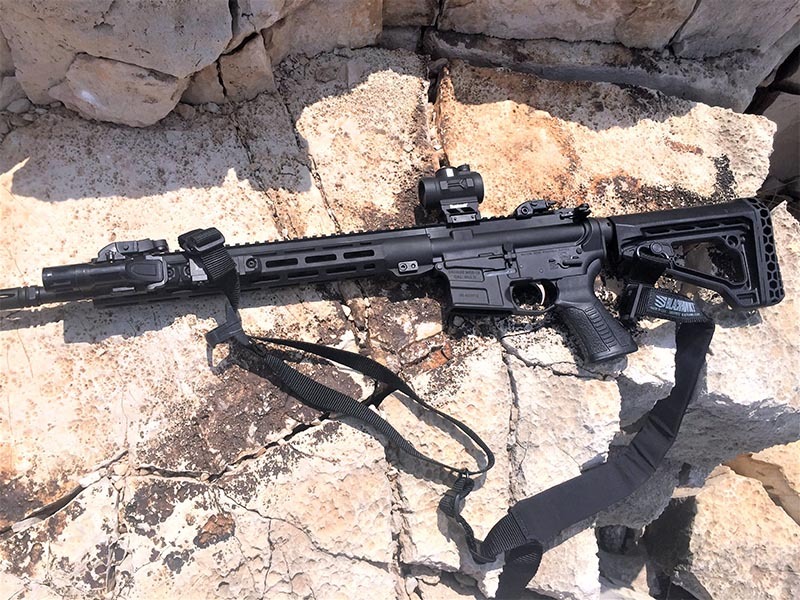 Make a habit of navigating with the tip of the buttstock anchored where it will be when you’re firing, probably at the bottom or top edge of your collarbone. 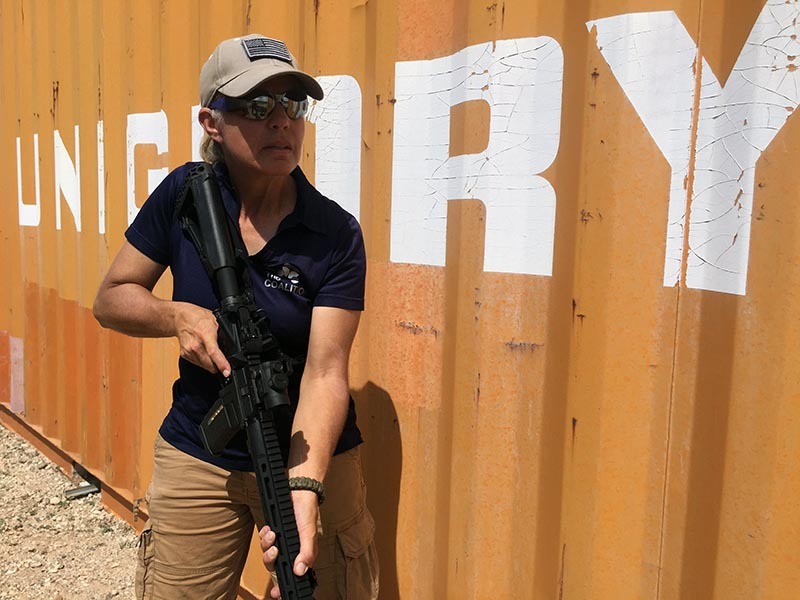 When movement is done with the carbine’s length aligned with your body, you’re less likely to make the self-defeating error of catching it on things like curtains or a bedspread. Deploying of the carbine from this pivot point should be efficient, with a field of view through the sights or optic instantly available. In setting up the eye relief of optical gear for indoor carbine use, it may be helpful to set it at what works when the stock is fully collapsed, where it’ll be easiest to manage in tight quarters. If you’re likely to drop to prone in your environment, set it where it’s comfortable in that position. You can always place your head farther forward on the stock for the shorter eye relief required for the standing position. Zeroing the carbine at 100 yards is a common and perfectly good practice. However, that means that at typical home defense distances, the point of impact will be lower than the set zero. An additional factor to consider is the height differential between the bore and the sight or optic you’re looking through. With the high-mounted optics required to obtain a cheek weld on most carbines, that difference may be as much as three inches. In most cases, this difference is inconsequential, and in fact sighted shooting may not even be required during your close-quarters encounter. However, if making a precision shot is necessary because of a hostage situation, barricaded assailant, or other circumstance, being confident about your hold-over to compensate for this offset is critical! Understand that the closer the target is, the greater the holdover consideration. As a rule, this becomes an issue at distances of 15 yards or less. In my view, this is the most-neglected aspect of training for most people with their personal defense rifle. It’s not enough to set and memorize your hold-over, either. Both mechanical and electronic sights can get bumped out of place or lose their fine-tuning with heavy use or transport. Occasionally check and confirm that optics are tightly mounted and that your hold-over and zero are where you think they are. The advice here is by no means a complete primer of assets needed for successful home and family protection with a carbine. But, applying it will put you ahead of people who don’t bother to train, including most armed criminal actors. Equip, train, and prevail. How do you get ready for home defense? Do you utilize a carbine? Let us know in the comments below.